After nine months of tedious work removing undercoating from the undercarriage, engine compartment, and trunk, I can now see all that is needed to be done. 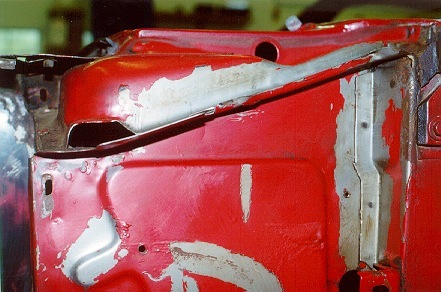 Every nut, bolt, fastener, and spec of dirt has been removed from poor ol' Mid, except the two doors and the trunk lid. 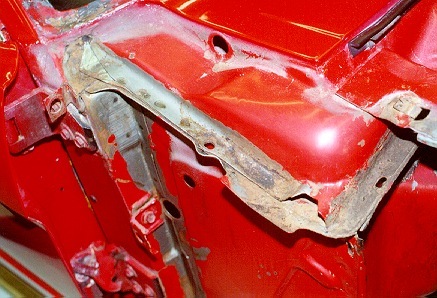 What's left is a combination of factory-fresh paint, rust, Previous Owner's botched repairs, and one accident in the car's prior history. OK...now for the Good News! 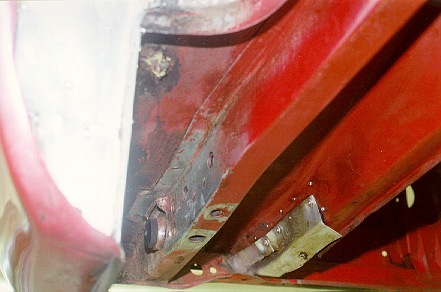 Here's the undercarriage, once it is cleaned up. Ain't she/he/it pretty? 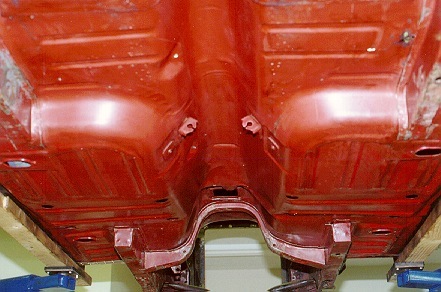 This is the original factory undercoating paint. 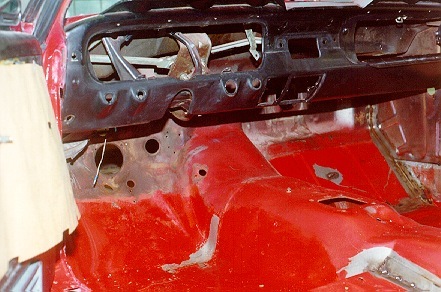 Beside it is the interior dash. Mid's mobility is restricted to up/down motions, but that'll change once it is mounted on a rotisserie, very shortly. The top of the dash shows factory paint behind the windshield lip, and no paint whatsoever on the metal dash. 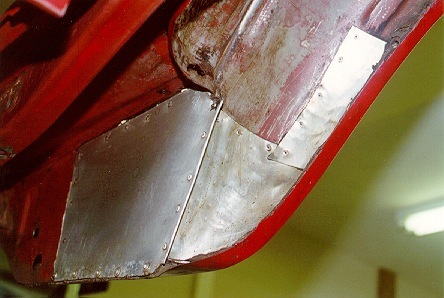 Both sides of the cowl show no rust, and careful inspection of the main cowl shows no rust. 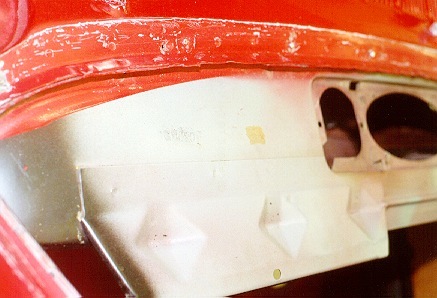 The underside (not shown) looks factory fresh! I found the reason for my windshield leak: a small hole, apparently drilled by a PO for the moulding clip, but it isn't aligned with any of them! I also found out why my rear-view mirror's top screw couldn't screw into anything: the bracket is completely missing! Was it even there at one time? 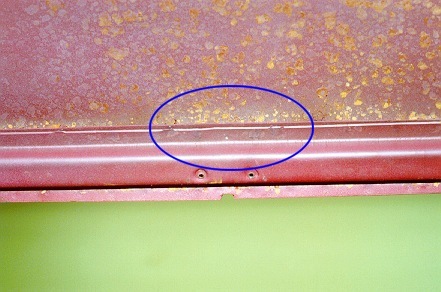 There's faint evidence of two spot welds, but there are others all along that header. Most of the bad is confined to rust of one sort or another. The Previous Owner's liked to cover things with aluminum patch panels. Let's take a tour, beginning at the driver's front side. 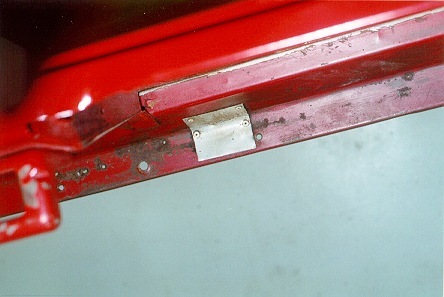 Here's the bottom of the kick panel. 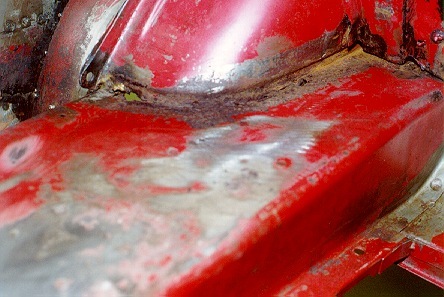 Beside it is the forward shot of the driver's side wheel well. 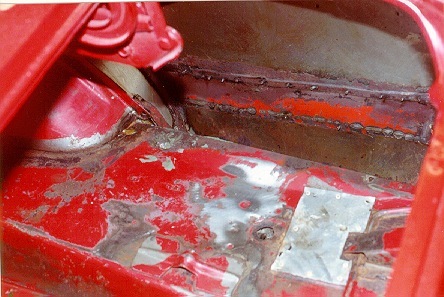 The third pic is what the trunk floor - wheel well intersection looks like. 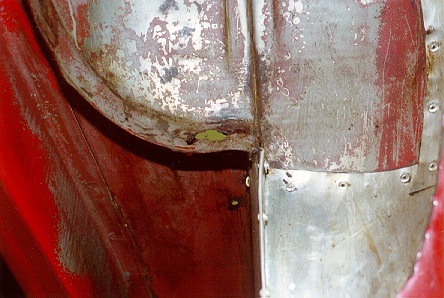 Now here's the back-looking direction of the driver's side wheel well, followed by the very top-looking view. What looks like green is really a hole! On top of the driver's side trunk floor was an aluminum patch, but I was anxious to see what was under it, so I removed it. Ouch! 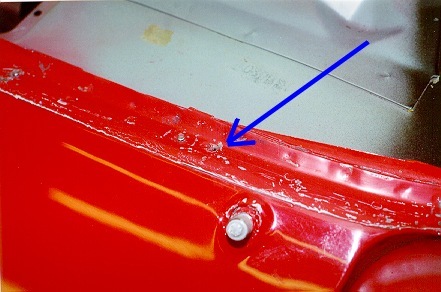 Next to that pic is the interior view of the quarter panel, showing a patch. 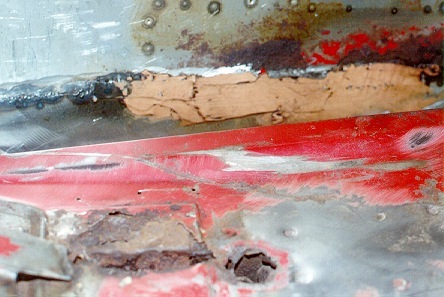 There's a strip of metal binding the two sections together, and covered by bondo. Not very clean, IMHO. 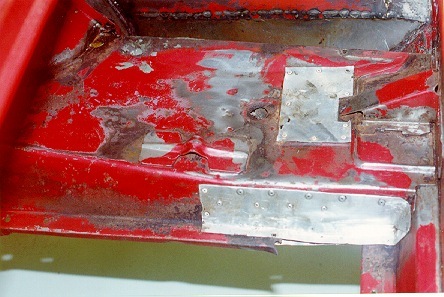 On the back part of the trunk, the PO patched a small hole with a large aluminum patch. Go figure. 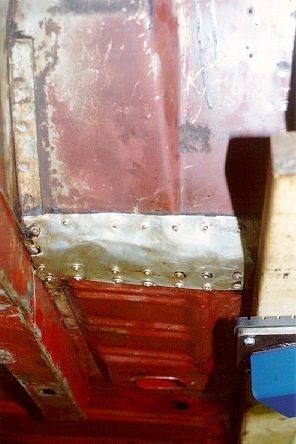 Next to that picture is the passenger side trunk floor. 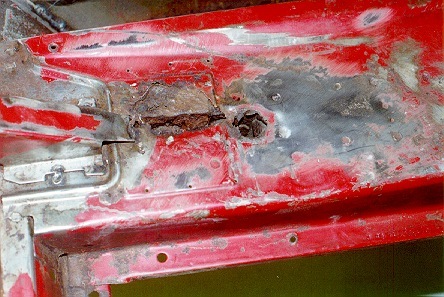 Note that the trunk support at the rear has completely rotted away. 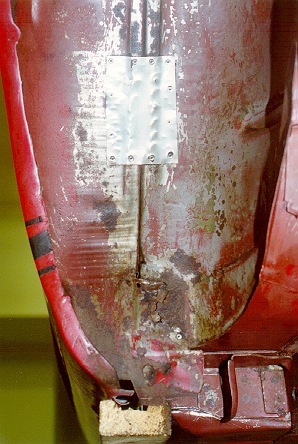 The passenger quarter panel was also patched, but again with a backing plate. There's a screw still sticking out into the trunk, but at least the welds look reasonably good. 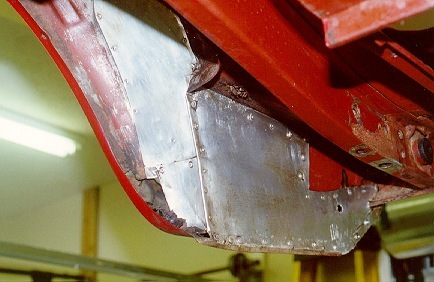 The underside shows even more aluminum. The PO musta worked for Alcoa! 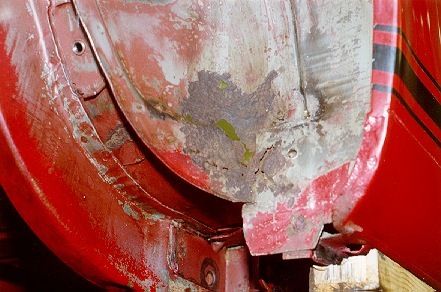 Continuing our journey, let's examine the underside of the passenger wheel well. The first pic is rear-ward looking; the second is looking forward.